Welcome to Moore Big Trees Cabin with the perfect blend of sunshine and shade. You can conveniently drive right to the cabin and there is plenty of parking. An amazing view awaits you regardless of the season. A nice spot when you want to relax in the summer shade and effective shelter in the winter months. Kids fort and Zip Line are in the background. Kids and adults alike will have a lot of fun with the zip line. This inviting part of the Moore Big Trees home is safe and rated for Adults. You won't worry about the line failing while your kid is on it. And, it is low to the ground so getting on and off is not a problem. Easy access and in full view for parents who are supervising. This raised deck is a childs delight all to themselves. Adjacent to the zip line and fort is this lovely hammock. Perfect for parental supervision as well as reading and napping. With the flat screen television and home entertainment sound system, the computer station and DVD collection, game room and outdoor fort and zip line, there is always something to do while staying in this beautiful cabin. Additional seating for 3 at the breakfast bar. This cabin comes with an amazing collection of DVD's located above the monitor of the computer. The home has wireless internet, and cable television along with a very nice sound system. Both bedrooms are on the main floor. Each have a queen sized bed and plenty of windows. View of the 2nd bedroom, also on the main floor. Downstairs bathroom has a combo tub/shower. The queen bed tucked in a corner of the back loft. There are a total of 5 twin beds in the loft. The two pictured here are located in the back end of the split loft across from the queen bed.Skylights let you see the stars at night right from bed! Upstairs bathroom. View towards the back of the split loft with the bathroom on the left, twin trundle in the foreground. There is also a flat screen TV in the game room. Play foosball or watch a movie from our library. View towards the front of the split loft. There is a twin trundle and single twin on this end for additional sleeping as well as the pool table, foosball table and more ! Where else can you play pool and have such an amazing view ? 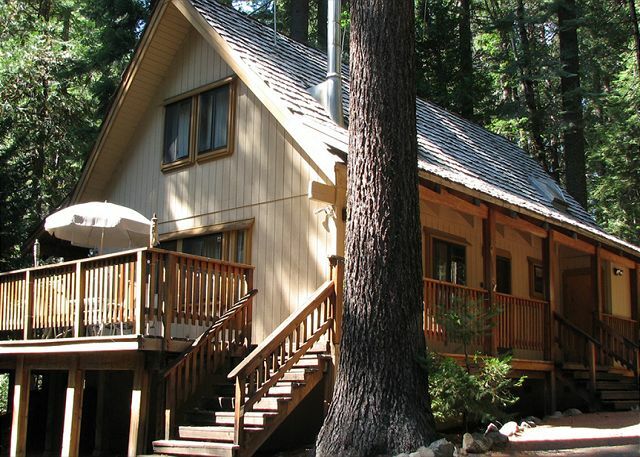 Cabin rental includes use of the Big Trees Rec Center during summer months (rec center guest fees apply.) The rec center offeres two pools - both "kids" and adult pools. You can explore local hiking trails with scenes like this one near White Pines Park. A short drive up Hwy. 4 from the cabin will bring you to this amazing Lake. ALL CABINS HAVE A HOUSEKEEPING CHARGE AND COUNTY TAX IN ADDITION TO THE RENT. 3 Night Minimum During Holiday Periods. Kids Paradise (Whatever Your Age!) This home has 2 Bedrooms plus a split loft and 2 Baths. Both bedrooms are on the ground floor, each with Queen size bed. Split loft upstairs has 2 Twins and a Queen bed in the back bedroom area. Up front is a Pool Table, Foosball Table, Dart Board and TV and twin trundle and a single twin. Great room also has a 42” flat screen. Home offers cable TV/DVD/VCR, a very large DVD/VCR movie library, computer with Wireless High-Speed Internet Access, free local phone access, large deck with a charcoal BBQ (Guests should bring their own charcoal). Yard provides a great play area for kids of all ages with zip-line, swing, tree fort/deck, horseshoe pit and hammock! Can sleep 12 - extra floor mats available. A portable baby crib available upon request. Dogs OK with prior approval. $25 per-pet fee may apply. No smoking. Big Trees Recreation Summer Membership (guest fees apply) Check out facilities & activities at http://bigtreesvillage.org/recreation-center/. Great location, ideal summer cabin for a family looking to spend some quality time together. I was happy with alevrything about the rebtal with the exception of the garbage situation. Due to the disposal site being closed for two days, we were forced to store our garbage inside and despite our best attempts, the smell was hard to cover. I recommend possibly renting a secure dumpster for those having big extended time frames in which the disposal site is closed. So sorry about the garbage situation. Our office does provide garbage pick-up. Next visit please call us to arrange this service for you. Unfortunately even with secure garbage containers bears are atttracted by the garbage smell and then become more frustrated. We do not want bears anywhere near our rental properties for a frustrated bear is a dead bear and we do not want these beautiful animals eliminated due to garbage attraction. Glad you enjoyed this wonderful cabin and we hope you will come to the Moore Big Trees cabin as our guest again. Thank-you Coe Family for returning as our gusts again at the Moore Big Trees Cabin. Hope to see you again next year! I visited with my daughter,son-in-law and 3 grandchildren (15 year old boy and girl twins) and 8 year old little sister. Everyone found games, and activities they enjoyed doing. Cabin was great! Accurate description. It was clean, although carpet could use shampooing. Reservations was easy. Managers were helpful and professional. Beautiful lakes, rivers for fishing. Big Trees State park was wonderful highlight of weekend! Definitely will recommend to friends. So glad you had a nice visit. This cabin is well enjoyed by many returning guests. The carpets are cleaned twice a year and after the summer season this will be addressed again. The cabin was comfortable. Only problem was the kitchen appliances. the oven did not work and the dishwasher didn't clean dishes in the top shelf. The oven is new and worked just fine when checked after guests mentioned the temperature of the oven did not heat appropriately. Guessing this was guest error in the use of the settings? The dishes put in the dishwasher cannot have dried food left on them for this will not clean them appropriately. 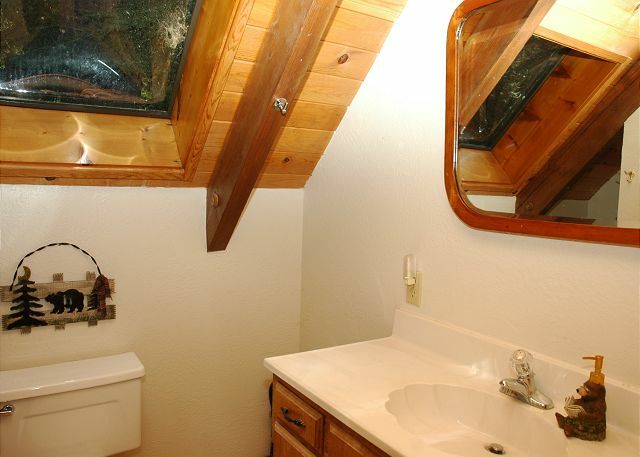 This cabin has just about everything you could want in amenities. A favorite for many returning guests year after year. The zip line is one of the highlights of this cabin, enjoyed by both adults and children. Come and try it for yourself. We were happy with our vacation rental. The house was well equipped and very clean. We would absolutely stay here again! The cabin is cozy and comfortable, ample space for kids and adults, kitchen is well stocked. We would definitely go back. Thank-you Maria. We would love to have you return to stay with us again. We had a quiet getaway Thanksgiving week. Just what we needed! This was a great place to ride out the late season winter storm. The cabin was comfortable, plenty roomy for our family and well stocked. The kids loved the loft and spent hours playing pool and foosball. The DVD collection was unparalleled. Highly recommend. Thank-you Lauren. Please come back again. This truly is a kids paradise. It was great. Everything in the process went smoothly. Questions before booking were answered quickly. Cabin was just as described. They even had the heaters on and lights. The sign for the cabin address/name should be more visible. This is a perfect cabin for two families with a lot of kids. Great activities and off of the grid, as we never were able to get the wifi to work, but that is part of the mountains. Loved the new furniture. Great Kitchen and lots of hot water. Very clean!! We did miss the gas grill and had to go buy charcoal, but no big deal. Thank-you for the comments Amy. This is the perfect cabin for families to gather. We hope to see you again next year. Our family had a fantastic vacation at Moore Big Trees. The kids had fun. The zipline at the back was especially fun. 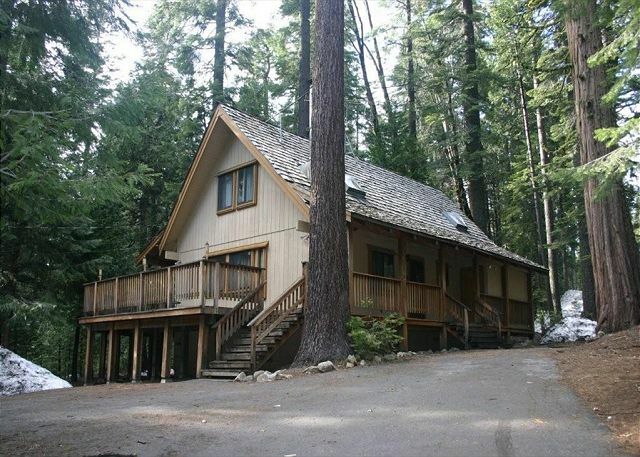 Situated in Camp Connell, this cabin is ideally located with easy access to Hwy 4. The work areas with the roof skylights on the 2nd floor were just perfect for a quiet read, focused work, with tons of natural light filling the entire area. Big Trees Realty were very helpful, considerate and timely. Was a pleasure to work with them! Would definitely rent again through Big Trees Realty. Our kids had a so much fun. Smiles from ear to ear. Everything was Awsome. We are so glad you enjoyed your time at the Moore Big Trees cabin! The cabin was amazing! A bit smaller than we thought but felt 10 times the size. Wonderful weather, warm nights and cool days in the cabin. Pool table and fooseball table kept everyone entertained. Very clean when we arrived. Thanks for your review! The Moore Big Trees/Kids Paradise cabin is one of our most popular. The cabin is just under 1700 square feet but with the large loft upstairs it certainly feels much bigger. 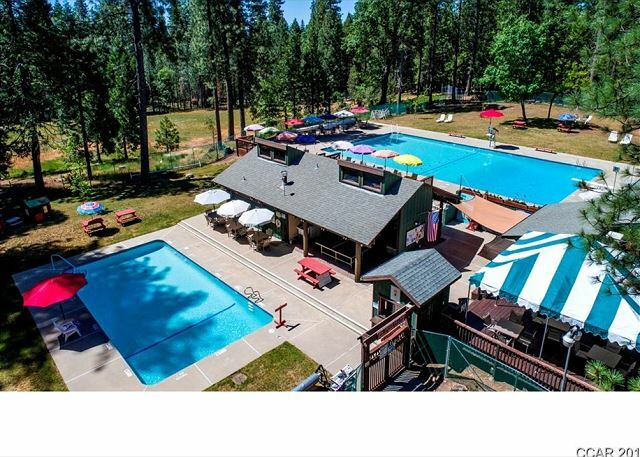 The cabin has tons of amenities, including the pool and foosball tables, and is set up for kids and adults alike to have a blast while staying. We are very glad you enjoyed your time there and hope you come back for another visit in the future! Kid's paradise, and great parent place too! Wonderful inside and outside space. So fun and relaxing! Easy to get to, close off of 4. Thank you for your review. We are glad you enjoyed the Moore Big Trees cabin. It certainly has just about everything kids and adults will enjoy to have a comfortable vacation in the mountains. We are glad you appreciated it and hope to see you again in the future. This Cabin was perfect for enjoying the snow. Thank you for your review. We are glad you enjoyed your time at the Moore Big Trees cabin. 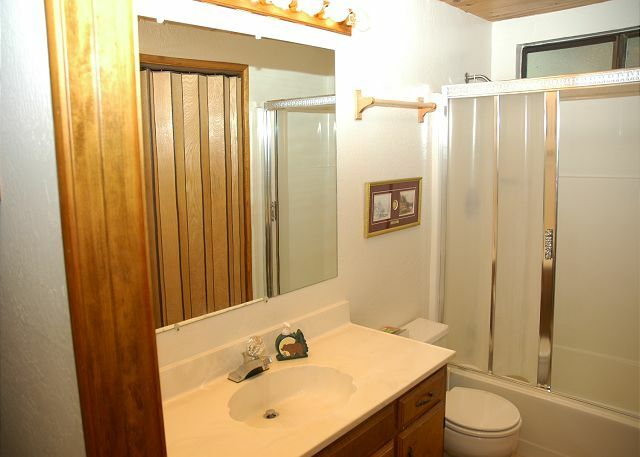 The property is very well appointed with lots of amenities and a great location for snow fun. It looks like these folks reviewed the wrong cabin! They stayed in one of our most popular homes, the Woodbery Lodge. I'm not sure what wasn't clean as nothing was reported to us, but glad that this family enjoyed their stay. The proximity to Big Trees State Park is definitely a perk! We stayed at the Moore Big Trees cabin for 3 nights. 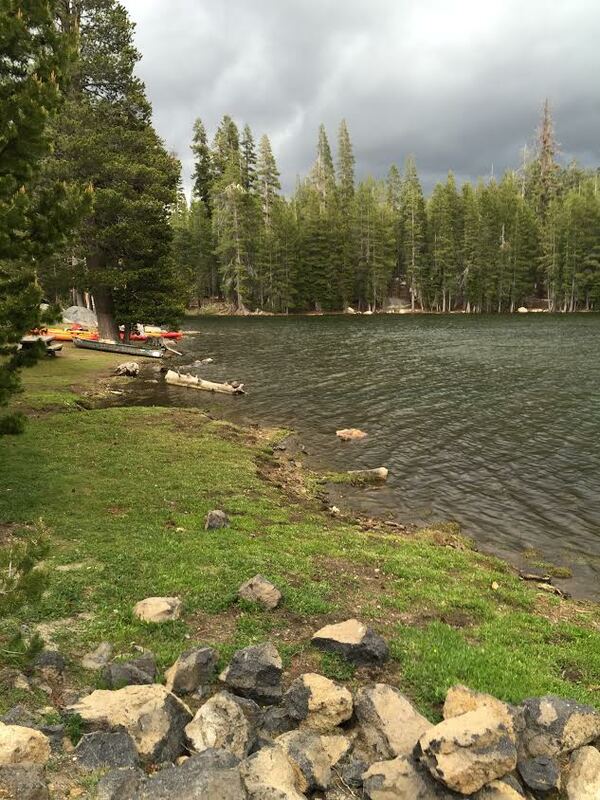 The cabin is well located, about 20 min drive to Bear Valley. It has lots of entertainment including a zip line, a pool table and a huge selection of movies and games. The kids had a blast! The cabin was clean and the beds were comfortable. This is the 4th time we use Big Trees Real Estate for renting a cabin in that area, they are very friendly and accommodating. They have always provided excellent service. Thank you for your kind remarks! We are so glad that you enjoyed all of the available fun activities at the Moore Big Trees cabin. This property is well stocked and is always enjoyed by guests young and old! The zip line is always a popular item, especially because the owner leaves it up for use year round. We strive to give our guests a most enjoyable stay and are pleased to hear that you enjoyed your time here in the mountains. Thank you and we look forward to having you back again! Great cabin in the pines! We had a great time and will return. This cabin has so many fun things to do and is close to a grocery store and ski resort. It snowed the first day we were there and was so pretty. All the kids had a great time playing pool, foosball and video games on the day it was drizzly and cold. The management company is very helpful and friendly, as well. We are so glad you enjoyed the Moore Big Trees cabin! It is a very well equipped cabin and has fun amenities for both young and old. It is quite beautiful when the snow dusts the forest. Thank you for your kind comments and we look forward to having you back! We have been going to the same place in Big Trees for the last 8 years and love it there. Especially when there is snow around the area. But we still enjoy the woods and fresh air and the cabin we stay in. The rental management is very personable and helpful! And we enjoy the convenience of Bear Valley not far away! The cabin was great. Quiet, close to the river, loved the rec center and the lake was great. Zip line and swing were a hit. The only concern was the zip line was broke at the bottom. My husband fixed it. The deck was dangerous in some spots. Needs o be refinished . This owner is diligent about up keeping his cabin. We will check the zip line. I walked the deck and could not find any area of concern? Thanks for the comments, will inform our owner. It was a year ago that we stayed at the Moore Big Trees house had a blast and came back to visit it again. The "Kids Paradise" in the title secretly means "will bring out the kid in you". We brought a handful of teenagers and were able to let them do "their" thing, while we went on to do "our" thing and really had a chance to settle in and enjoy some of the many amenities. I really appreciate the location and room to play outside. Next time, we will have to come in the summertime to appreciate the nice deck and speakers wired in everywhere. As always it is a pleasure dealing with Sierra Vacation Rentals/Big Trees Realty. The place to stay when taking time with the family! Dan was great with a last minute reservation, and Linea waited after hours, because we were delayed in getting up to pick up the keys. the condition of the cabin's furniture is a bit dated, but we did not go to sit to grade the furniture. They stated you need to bring some basics but alot was there already provided. The pool table, fooseball, darts and now a days the wifi was great to unwind after a long day of snowmobiling, Skiing or sledding at Bear Valley. Parking for 5 vehicles and if it would snow the kids could sled in the drive way , because it is located in the back of a circle, or play on the swing or ride the zip line. We will be back! We love the cabin and the location, plus the swing and how there can be snow around the cabin, though this time not quite enough to sled on the grounds. We greatly appreciate the owners renting their cabin out to people. And we noticed the cook top was fixed with all 4 burners working. -- Thank you! We had a great time at the Kids Paradise cabin. All four of our children enjoyed the snow, including the baby:) There is lots of area for snow play. Overall good place for families with kids. Thank you. Everything was great except of a challenging driveway. We had a lot of snow during our stay, and returning in the evening from skiing required a lot of shoveling and several attempts to drive up the driveway. Always bring chains along with you if traveling to the sierras, especially if you do not have four wheel drive. This driveway has a snow plow contract and is cleared as often as needed with the snow fall. A wonderful place to spend family time in the evening cooking dinner and eating around the table. River fishing was great, and visiting Lake Alpine, Spicer Res. and Pinecrest Lake were so much fun for all of us. Shopping Murphys was a plus for the girls and let's not forget our visit to the Caverns!! We really enjoyed our stay at the cabin, it was clean and had everything we needed (and a lot more) for a very enjoyable stay in the mountains. But... I'd have to say the boys had the best time, tons of entertainment for them, they had a blast. I think the fee for the receation area is too much. I only used the pool for two days ( totaling four hours) - I was charged $ 35.00. I would like a newer cabin next year. Recreation pool use is optional. There are many wonderful lakes in the area to swim at if a pool isn't your choice. The lakes are free. This cabin is hard to pass up for the many amenities that it has to offer. Guests return yearly to this cabin to enjoy the Zipline, and to discover the new amenities that this cabin owner has added for guest enjoyment. This year a horseshoe pit has been added and has been a popular addition for our guests. We loved the location, it was up higher than previous rentals and the area surrounding the Moore cabin was spacious. As soon as we walked in, the kids instantly had their music going upstairs and you could hear them having a ball playing pool. The zip line outside was also a hit. We were fortunate enough to be there and get a good dose of snow. As always, the property management was more than helpful and always friendly. Great house for our family of four (two young children) and dog. There was pleanty of roaming around area and fun things to do at the house (zip line, fooze ball). We look forward to our next stay at the Moore House! It was very quiet and peaceful, well it was quiet until the kids were screaming with delight using the zip line and swing! This was a great place for the kids and the adults, and I am sure we will be back again. BBQ and play some family games. Kitchen had everything I needed tool-wise for cooking. Do bring slippers or thick socks - not the place to walk around barefoot. The housekeeping staff prepares all of our cabins for guest arrival in this way. If you come at night then lights are welcoming instead of entering a dark cabin. The fans were to keep the cabin cool with the summer heat. And the music was just a nice welcoming atmosphere to walk into. This was the first time we have heard it being unpleasant. We had a great time at the cabin. Had a killer billiard competition. The deck was awesome. The property was clean from the cleaners coming through, but it really needs a deep cleaning. Alot of the pans, silverware etc. wasn't very clean- but it is now! The cupboards need to be wiped out and organized. The carpets need to be cleaned. (walking barefoot turned all our feet blackish) Also a little more space in the cupboards for food storage or somewhere would have been helpful. We would recommend it to people certainly and the management was most accomodating. I am only mentioning the cleaning to help you get a feel for what needs to be done. good vacation!! ...to one of the most wonderful vacation homes we have had the pleasure to enjoy! All the amenities, room for the kids and just feeling right at home. Thanks for a great vacation! The adults and dogs really enjoyed their stay! Just wasn't a long enought vacation. Quiet, private neighborhood. Lots of snow to build snowmen and igloo. Not enough incline for sledding, but the zip line and tree swing in the backyard were lots of fun. Great having the pool table and foosball for entertainment at night. Stereo system is also piped throughout the house and even outside. There's independent heating in each bedroom -- a big plus. There are plenty of DVDs, and a game console. Internet was available but on a very slow modem connection. Would be nice if there was WiFi and broadband considering there is no cell phone reception. There's a W/D so you can wash your clothes which means less to pack. Plenty of heavy blankets and pillows are provided but are old. You must bring your own towels, pillow cases, and sheets, which is a little cumbersome. Overall, the house cleanliness was satisfactory. Some of the windows were smudgy and the oven needs cleaning. (Next time I'll make a note to management.) It was a little much that we had to put all the dishes away from the dishwasher, clear the fridge, gather up all the garbage, take off our linens and make the beds before we left at 10 am. I was hoping our cleaning fee would take care of that. Then again, that could be why the cleaning fee is so low. We will stay in Big Trees Village again. The cabin has some ammenities for a big group, Pool table, foosball, darts, computer, lots of movies, etc. Our only problem was that we could not figure out how to work the tv for broadcast channels. Fun house to stay at. Plenty of room. Activities and store close by. Will rent this one again. We really enjoyed the cabin. The amendities were great. The couches felt pretty old as well as the carpet. Since we have allergies in our family, those things are a concern for us. Everyone stated healthy and we'd stay there again. Location is perfect for taking off to explore the high country. It was a fun summer mini vacation for us. The water heater breaker switch was turned off, so we didn't have hot water our first morning until I called to find out why.